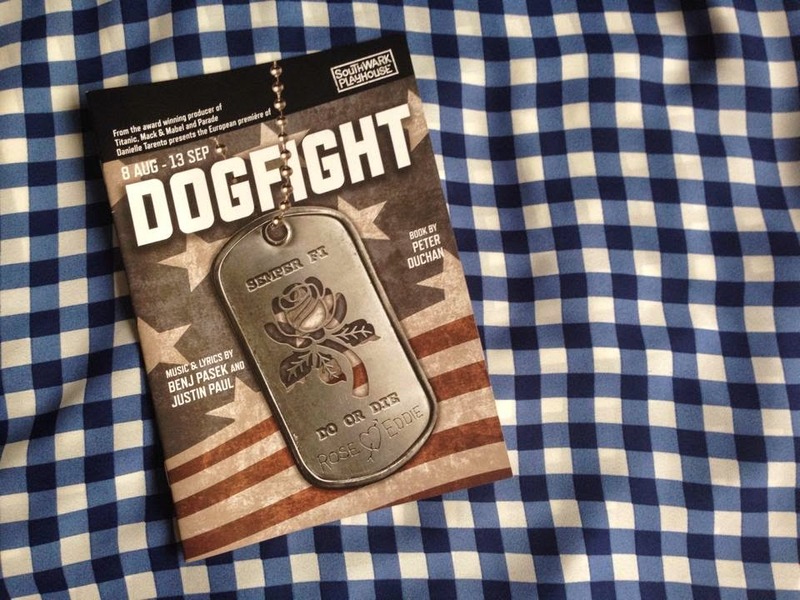 Let me start by sharing my Dogfight journey with you - It must have started about two years ago when the show first opened off-Broadway. The insider hype that surrounded the show intrigued me and I gave a few songs a listen and then left it at that ("Before It's Over", "Pretty Funny" and "Dogfight" where the songs that initially really stuck out at me). I left it at that and it wasn't until my friend Jess mentioned she was going to perform "Before It's Over" as part of her Music GCSE preperation that I was thrown back into the world of the show. I listened to the soundtrack again, fell in love with every single song, and thus my love was born. Since the show's Off-Broadway run back in 2012, the show hadn't made it's European premiere until now. After Jess and I had missed out on going to see In The Heights at the Southwark Playhouse a few months back, we made sure that we had our tickets well in advance. I have been a massive Klendez fan (that's Lindsay Mendez and Derek Klena for those of you that don't know) ever since they starred in Wicked as Elphaba and Fiyero respectively; they're the firmest of friends and they have fantastic chemistry so it's no surprise that their performances in this show as Rose and Eddie were simply outstanding. With this in mind, I was extremely nervous that Jamie Muscato and Laura Jane Matthewson (the actors taking those said leads in this London production of Dogfight) would be absolutely pants compared to Klendez. Add this thought to the sight of the Off-West End theatre that is the Southwark Playhouse and you have got my idea of two hours of hell. I sat in the theatre waiting for the show to start for a good twenty minutes or so dreading what was coming next and knowing that I would hate it (luckily I didn't say anything though because a man from the International New York Times was sat right behind me). I'm very happy to say, though, that these terrible thoughts were totally destroyed within moments of the lights going down. The small space turned into an intimate one on one session with these characters that are being portrayed by such wonderful actors with beautiful voices and oodles of talent. Not only did Muscato and Matthewson impress me, but they actually made me love their portrayl of the characters more than I loved Klendez's; I left the theatre genuinely hating Eddie for being such an idiot so I'm sure you can imagine how convincing their acting truly is. I would happily sit here and list off the standout actors in this performance, but every single person that stood on that stage was so incredibly talented that I think picking one that was better than the others is near impossible. What I will say though is that Rebecca Trehearn and Laura Jane Matthewson's performance of the title song "Dogfight" was so incredible that I wanted nothing more than for them to sing it over and over again after they'd finished. Never have I seen someone sing as powerfully as Trehearn did in that performance and make it look so incredibly easy at the same time. Incredible. In short, I recommend that you drop everything right now and book tickets to see this show before it closes on the 13th of September. Never have I seen something so captivating and emotionally raw as this show, as well as it being so charming and humorous at appropriate times. A fantastic show all around. Bravo. I'll also be uploading some clips from the post-show talkback session with the Tony Award nominated Musical Theatre composing duo Pasek and Paul and the show's bookwriter Peter Duchan in Wednesday's Weekly Vlog that you can see on my YouTube channel, here.